Baroque cloth is the hardest and most delicate cloth for me to handle QAQ a slight rough edge touches the cloth, you go bye bye and crying. Sewing the whole night, and when i was almost done i decided to try it on and guess what? manatau around 11am Jen replied me saying they managed to find sponsors for the cheongsams! It was my first time winning a title! Thank you to all my dear friends for all the support :) Because of you guys, i'll do my very best in everything! Here are a few photos of the event :) enjoy! So you are the winner....?? 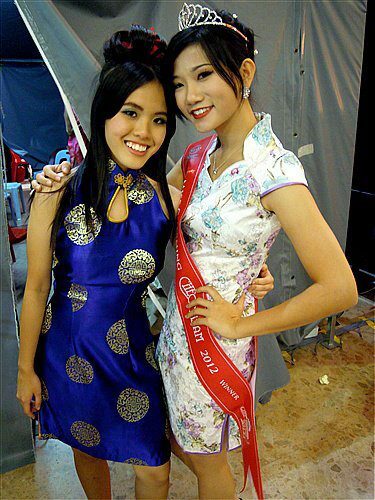 I have posts about Miss Cheongsam Malaysia 2013, you did not take part in the 2013 right?